I was speaking to a PhD student in my program yesterday and the topic of balance came up. I mentioned I was going home to finish a short story about a screw, to which she commented that it was good I was setting time aside from my studies for creative pursuits, taking some time for myself, so to speak (d’awww). 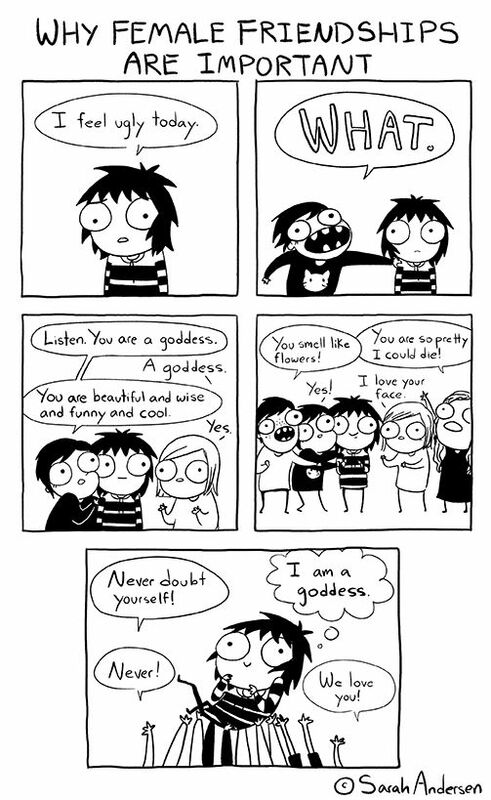 Once again, Sarah Andersen perfectly expresses my sentiments. She’s inside my head, people. Back to what I was saying. Short story. Right. Sadly, I am not engaging in any such pursuits – sorry to disappoint, people, but you will see no short stories published by me any time soon. If you’re really itching for some short story action, check out Alice Munro or something. The short story I was referring to is The Turn of the Screw by Henry James, which I’m reading for my class on fantasy and the social imaginary (YUP! That’s a class and I’m taking it BECAUSE THIS IS MY LIFE NOW AND ITS AWESOME…sorry was that out loud? #sorrynotsorry). I cleared up my miscommunication, but it did bring up the topic of balance. It was an interesting question for me, because after a brief reflection I said that I don’t really have any balance in my life right now; essentially all of my time is dedicated to being a graduate student. But (ha! this is my blog, I can start a sentence with the word “but” if I want to!) But, I don’t need balance, I don’t need “me time” or “down time” or any such thing, because for me, this entire degree is my “me time.” Leaving behind a full-time, permanent position and throwing myself fully into a masters degree in English is pretty much one of the most selfish things I have ever done (if not the most selfish). This entire degree is a self-indulgence for me, and though it is challenging and demanding, it is a wondrous, exhilarating kind of exhaustion that I feel at the end of the day. I know – “exhilarating kind of exhaustion”? Come on – don’t I know what “exhaustion” even means? But (ha! did it again!) But I’m being serious. Whenever I start to feel anything even remotely close to spent, or burn out, from late nights reading, or hours of research, or prepping for tutorials, all I have to do is remind myself that I’m feeling tired because I’ve been spending all of my time reading and writing and/or thinking about reading and writing and/or talking about reading and writing and then – BOOM – I’m exhilarated. Concerned Friend: You look tired, what’s wrong? Me: I stayed up until 2am reading last night. Concerned Friend: oh, that sounds awful. Me: wait, that’s not awful – THAT’S AWESOME!!!! See what I mean? That book that kept me up until 2am? It was Can You Hear the Nightbird Call? and if you don’t follow me on Twitter (which you should, I’m awesome and witty), then take my advice now and GO. READ. THIS. BOOK. It was ah-mah-zing. That’s right. I’m bringing Casey Williams back (you may remember her from such posts as my one on The Count of Monte Cristo) because that’s how good this book was. It gave me all of the feels, you guys. I was in a glass case of emotion. I couldn’t even handle it. I was up at 2am reading a book bawling my eyes out and I couldn’t put it down. CYHtNC tells the story of the diasporic journey of three women who emigrate from India to Vancouver during the mid-20th century. The novel begins around the time of Partition (1947) in India, when Punjab was hacked and sawed apart by the Border Commission to be split between India and Pakistan. It ends with the Air India bombing (1985) which had its 30-year anniversary last year. I was familiar with a *little* bit of this part of India’s history from reading Midnight’s Children and I think I first heard of the Kamagata Maru incident (1914) on an episode of the podcast Stuff You Missed In History Class but otherwise I was exposed to a lot of new history. In the instances where I was familiar with the historical events, I got a new perspective, as well as a pointed (and fair) reminder that many of these events are as much part of Canadian history as they are Indian/Punjabi/Pakistani history. I cannot stress this enough, go out there and READ THIS BOOK! N.B. This happened a lot during Mary Barton too. I have a feeling this gif is going to come up a lot in my MA…fair warning…seriously, you should see the number of times I scribbled “clever girl” in the margins. I’m so glad I was introduced to Austen this way – Northanger Abbey is short, sweet, funny, sarcastic, and has me now looking forward to reading her novels which are on The List (which is basically all of them, except Northanger Abbey, because of course). Note: I haven’t read this post over, but I have to go be a grad student now, so apologies for any typos, etc.